Yes, that is a flaming stick that Theo has masterfully pulled from the fire while his unsuspecting parents were preparing dinner. No worries – the stick was taken away from the dog and no injuries occurred. He attempted to retrieve the stick many times from the fire grate. Does he fetch? Evidentially, only sticks that are on fire. 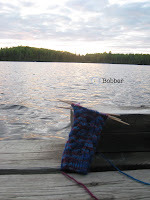 4.You cannot knit and paddle simultaneously. 5. You can knit and fish simultaneously! This entry was posted in Uncategorized on May 30, 2007 by Jennie. I love that bit about your dog. It reminds me of some people I know.